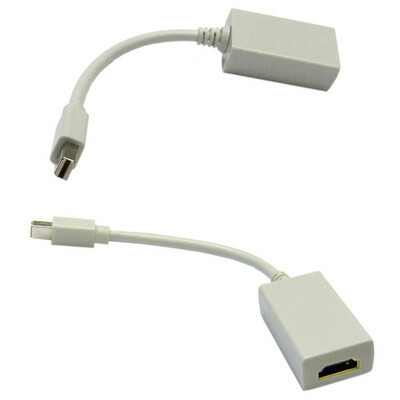 This Mini Displayport to HDMI adapter will allow you to connect a HDMI cable into a Mini-DisplayPort compatible device. Perfect for when your display uses HDMI yet your computer or laptop only has Mini-DisplayPort. This adapter does not support audio. Purchased this product to convert existing cables to a new computer's display card connections. Works great and is a good value. This was the cord I was looking for to link my macbook to my small projector. Work great. Now I can show my powerpoints and travel movies to others. Thank You. Worked great with my Surface Pro 2, and much less expensive than the adapter sold at the Microsoft store. Waiting on my MAC but it looks very robust! I got what I need in an efficient way. The product worked as expected. Have not tried this yet but seems solid, nice price too. excellent price. apple wanted $35 for the same thing. CableWholesale Response: I apologize for the defective unit you received. We would be happy to send a replacement and/or return shipping label. The visual quality improvement on my big screen tv (Sony 52" Bravia) was significant compared to using the VGA connectivity. Specifically the annoying slight shadowing was eliminated!!! Now the tv looks as good as the mac book pros display. I highly recommend this adapter. Works great with HD projector and Plasma display. If you only see DOC, it might just be you have extended display setting and should use mirror. It hooks up the mac to the TV ok, but just shows dock. Prob should have ordered mini display port to computer input on tv.